Minister for the Natural Environment and Fisheries Richard Benyon MP was in the New Forest yesterday (Monday 9 May) at the invitation of the New Forest National Park Authority to meet local organisations and learn more about the Forest. Mr Benyon met National Park members and officers at the New Forest Centre, Lyndhurst, and heard how successful education partnerships are making a real difference in helping people learn more about the unique landscape and wildlife in the New Forest. Mr Benyon then visited a stream restoration project at Fletchers Thorns, off the Rhinefield Drive near Brockenhurst. The stream restoration is one of a number of projects funded by a Higher Level Stewardship (HLS) scheme, which works to improve these internationally-important habitats and supports the ancient practice of commoning – so vital to the unique landscape of the New Forest. 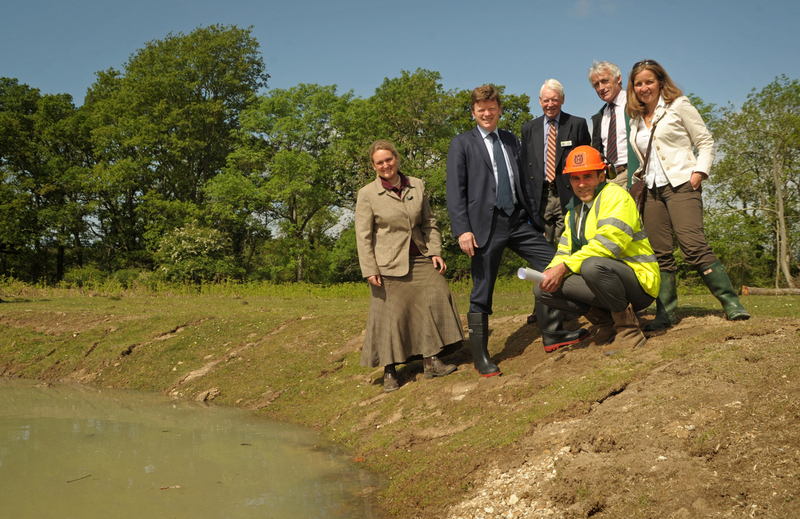 Chief Executive Alison Barnes view a stream restoration project near Brockenhurst. During the site visit he met representatives from the Verderers, Forestry Commission, New Forest Association and Natural England, who worked in partnership to secure the largest HLS scheme in Europe – worth £16 million over 10 years.